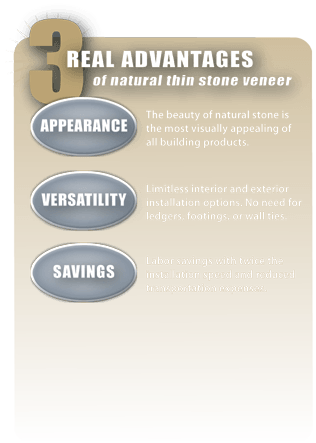 The natural stone veneer from A New Design Landscape & Stone, Inc. is an authentic real stone product quarried directly from the earth and cut to 3/4″ to 1-1/2″ in thickness. Unlike most artificial stone, natural thin stone veneer will not fade or discolor with time, and is not affected by scratching and chipping of the surface. It comes in natural tones and hues, allowing for creative and custom patterns. It is ideal material for use where weight limitations are a factor. Natural thin stone veneer may be used on interior walls, fireplaces, or on exterior walls of a home or building.